Living at Marybone Student Village 3 means you’ll be in the best possible location to make the most of your university experience. You will find yourself right in the heart of Liverpool city centre with LJMU just a few minutes’ walk away. Our double en-suite student rooms come fully furnished with all your bills included in your weekly rent as well as free WiFi. There is maintenance support on hand should ever need it, as well as 24 hour security. Marybone 3 offers a free on-site gym, cinema room and common room where you can enjoy spending time with your friends. Find out more below and book your room today for just £1! Marybone Student Village is located in the heart of Liverpool, adjacent to John Moores University Library and Resource Centre and a few minutes’ walk from Byrom Street University buildings The accommodation is located in three adjacent buildings with a total of 817 rooms available. Marybone Three accommodation features en-suite bedrooms with a shared kitchen and lounge in flats for four, five or six people. You'll also enjoy a spacious common room with pool table and Sky TV - a great place to spend time with your friends. Make the most of your time at Marybone with our on-site gym and cinema room. See what life’s like at Marybone Student Village in this short tour of the accommodation from one of our students. Marybone Student Village is a purpose built student complex, with a local convenience store and health centre on site. A larger supermarket is just 10 minutes away. The accommodation is also 10 minutes from the city centre, with the Liverpool One Shopping Centre providing a great range of high street stores. 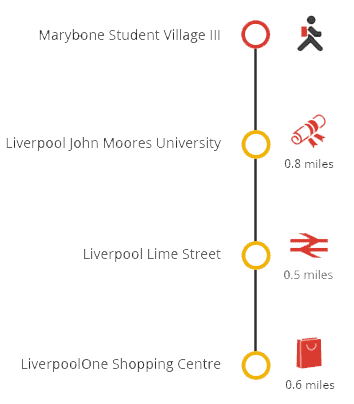 Liverpool Lime Street train station is also 10 minutes away and provides excellent rail links to Manchester, Birmingham and beyond.